All homeowners know how easy it can be to stray from a budget when it comes to home repairs and upgrades. If you’re looking to update one room or your entire home, at Bretz Interiors serving the greater Denver area, we’ve got some tips that might help. Read on! Remember that you don’t need to do everything at once. Take your time to do it right! Work on one room at a time, which will allow you to spread out the expense by making long-range plans. Start by making a list of everything you want to accomplish. Once your list is complete, determine how much money you can realistically spend. Setting up a reasonable budget will allow you to enjoy the renovation process. For more bang for the buck, remember that even a small change can have a big impact. For example, if you’re feel like the upholstery on your couch is outdated, don’t immediately jump to buying a new couch. Instead, consider some new throw pillows to update the look, or get a slipcover. Simple changes to your décor can revamp a room as well—consider simply rearranging wall hangings, adding some new knick-knacks, or putting a mirror in the room to add visual interest. These small changes can make a big impact and help freshen your room without breaking your budget. Invest your money on the things you first notice when you walk into the room. Window treatments can be very transformational. For example, you could add soft sheer treatments. When it comes to soft window treatments with a modern flair, turn to the collection from Hunter Douglas. These beautiful, sheer horizontal shades provide a modern look by combining the functionality of a blind with the beauty of a fabric shade. To truly transform your space, check out Silhouette® Window Shadings, Pirouette® Window Shadings, or Nantucket™ Window Shadings. Or consider shutters. If your dream design includes elegance, European flair, or cozy country comfort, plantation shutters could be just the answer. 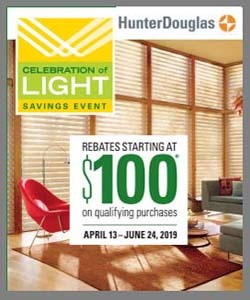 Hunter Douglas offers Heritance® hardwood shutters, NewStyle® hybrid shutters, and Palm Beach™ Polysatin™ shutters.